At De la Costa Eco-Lodge we pioneered eco-tourism in the area and we are still the only beach hotel to offer a comprehensive service for all travelers. Be it relaxing on a beach, snorkeling, diving , surfing, cloud forest tours, bird watching, wildlife and cultural safari, or tasting the local fares. So whether it be relaxing on a secluded Caribbean beach or swimming in waterfalls of a tropical cloud forest, De la Costa Eco-Lodge has something for everyone. See our Services Page. Below are the best attractions that make our area great. Some can be best enjoyed with our assistance whilst other you can do on your own, they are meant to give you better idea of what are the best things to see and do in the Henri Pittier National park at its Caribbean coastline. If relaxing on a palm fringed Caribbean beach in the middle of January is your idea of heaven….then look no further! There is a variety of amazing beaches in the area where at weekends the beautiful people of Venezuela come to unwind at the beach in their famous dental floss bikinis! The bay of El Playon where the lodge is located has several beaches accessable by a short stroll from the lodge further on you’ll find the colourfull fishing village of La Boca (the mouth !). 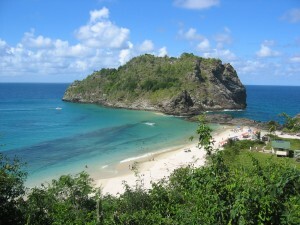 The most renowned and easy to reach is Cata Beach. Its popular with locals that come on weekend to relax and unwind in their famous Venezuela bikinis ! This spectacular palm fringed horseshoe bay is just 10 minutes ride from the lodge. 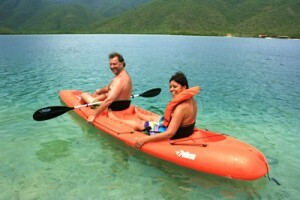 Fifteen minutes west from the lodge you’ll find the Bay of La Cienaga which is accessible only by boat. This mangrove lined bay boasts of calm turquoise waters and abundant coral reefs. 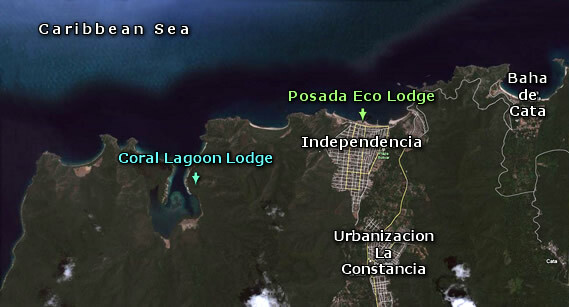 See our services in the Coral Lagoon Lodge of La Cienaga. You can bogie board on all of the beaches in the area as long as there are waves. 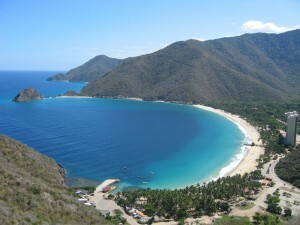 The most renowned Surfing beach in Venezuela is Cuyaga is just 30 minute ride from the Eco-Lodge. This is a remote afro-caribbean town meet surfing posee is in a beautiful setting and well worth a visit. There is also a great surfing/boogie boarding spot called la Punta just 5 minutes walk from the Eco-Lodge. 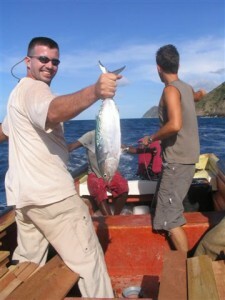 Fishing outings can be arranged with the local fishermen from la Boca. Aside from enjoying the breathtaking views of this spectacular coastline you most likely will return with a bonito, dorado, or king fish for lunch !. For shore fishing there is no end of places to cast from; the morning being the best time. Exploring and getting from village to village along this steep coastline is best done by boat. On these trips aside from enjoying the breathtaking views of virgin beaches youre likely to spot dolphins, flying fish, and if lucky, whale sharks! Exploring the mountains of the Henri Pittier National Park you will discover the exuberant fauna and flora that makes this area so unique. 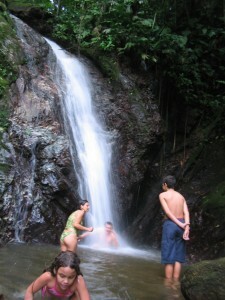 Walking in the cloudforest along the remains of old colonial cocoa trails you’ll find rivers and waterfalls running towards the coastline that make great resting spots where one can cool down with a dip! For a non strenuous exploration of the park please see details for the Henri Pittier Safari we offer. For longer treks into the forest for eg. to visit hacienda Santa Maria an abandoned coffee plantations high in the mountains – contact us and we will let you know your options. The Henri Pittier National Park’s impresive bio-diversity and bird life has long enchanted reknown naturalist such as Henri Pittier and Alexander Von Humboldt not to mention ornithologists such as William Bebee and Paul Schwartz. This protected area is one of the places of greatest biodiversity in Venezuela and on the planet. 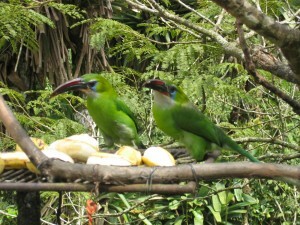 Its also easy to see how the park has earned its reputation as a bird watching paradise since within its boundaries can be found 576 species, almost half of Venezuela bird species. That’s around 7% of the world’s total! The variety of habitats located within the Henri Pittier gives rise to the abundant and fascinating bird life that this area offers.This makes the Henri Pittier National Park a must in any Venezuela birdwatching trip . Some of the special species you will find The endemic Venezuelan Wood-Quail,Violet-chested Hummingbird, White-tipped Quetzal, Groove-billed Toucanet, Guttulated Folliage-Gleaner, Scallop-breasted Antpitta,, Handsome Fruiteater, Venezuelan Bristle-Tyrant and the Rufous-cheeked Tanager can all be found here alongside other endemic species such as the Helmeted Curassow, and the Blood-eared Parakeet. In a area known as Cumboto, about 10 minutes driving from the eco-lodge, the bird life is very rich, especially in the dry deciduous forest where species like Chestnut-fronted Macaw, White-fringed Antwren, Scrub and Golden-fronted Greenlets, White-eared Conebill, and Streaked Saltator can be found. Within the cocoa groves you can also see Cocoa Thrush, and along the river, the Amazon Kingfisher, Spectacle Owl, and Fasciated Tiger-Heron are usually spotted. The Lodge’s gardens are visited by over 40 species of birds which come to feed from our bird tables or fly over.These include Magnificent Frigatebirds, Brown Pelicans, Glaucous and white-lined Tanagers, Bananaquits, Orapendolas, Yellow-headed and Crested Caracaras, cuckoos, woodpeckers, parrots and parakeets amongst others. Sugar feeders attract several types of Humming birds which enthral the guests with their territorial aerial combats. Our roof terrace is also ideal place for bird watching especially oceanic and coastal species, as it is above tree canopy level. 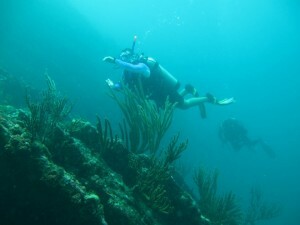 The steep coastline of the Henri Pittier National Park offers some of the great Venezuela diving and snorkeling sites. Whether you are an experienced diver looking for new challenges or a total beginner interested in a full diving course or a snorkeling induction, we offer a professional scuba diving service with multilingual guides. The coral lagoon of “La Cienaga ” is found just a 20 minute boat ride from the lodge and offers some of the best Venezuela diving and snorkeling sites in the surrounding coral reefs. The lagoon and its bordering mangroves teem with colorful parrot fish, angel fish, trumpet fish, moray eels, sea turtles and octopus amongst others, not to mention many types of flourishing corals and sponges. Our Full Day Outings to the Coral Lagoon Lodge include snorkeling equipment See our Diving Services and Coral Lagoon Lodge. The Coastline of the Henri Pittier National Park is a great area for the practice of sea kayaking. The season is from June to September when the seas and winds die down. For beginners the Coral Lagoon of La Cienaga is the ideal place to play with kayaks all year round due to its sheltered location and its many places to explore. All our services at the Coral Lagoon Lodge include the use of sit on top kayaks and your host Oskar, will provide you with all the gear and instructions for you to have a safe and fun time ! Visit our Coral Lagoon Lodge page for more information.